Full Sail Farm is a small, private facility in Ashland, Wisconsin owned by Dave and Julie Pagels. I offer lessons and training in dressage and eventing at my facility and off-site; I am currently taking reservations for training spots this winter at Big Rock Ranch, a lovely fully heated facility, and am available for lessons there as well. I have my USDF Bronze and Silver Medal Rider Award, showing through Prix St. Georges in dressage, up to Training Level in Eventing and unrated Hunters to 3'6". I've been fortunate to work with many great trainers over the years, and currently have the privilege of riding with Kate Phillips; and clinic with some talented trainers such as Jim Graham, Erik Dierks, Natalie Lamping, Alex Gerding, Loma Fowler, Jill Cantor-Lee, Charlotte Bredahl-Baker and Emily Juscher Miles. I represent horses for sale and usually have one or two of my own for sale. Feel free to contact me with any questions. I grew up in Lake O' The Woods Pony Club, based out of Duluth, MN. Pony Club taught me to be a complete horseperson; to properly manage every aspect of my horses life and to always put the care of the horse first. I received a well-rounded education, learning the ins and outs of several disciplines, the importance of teamwork and good sportsmanship and the significance of the friendships I developed and still hold dear. 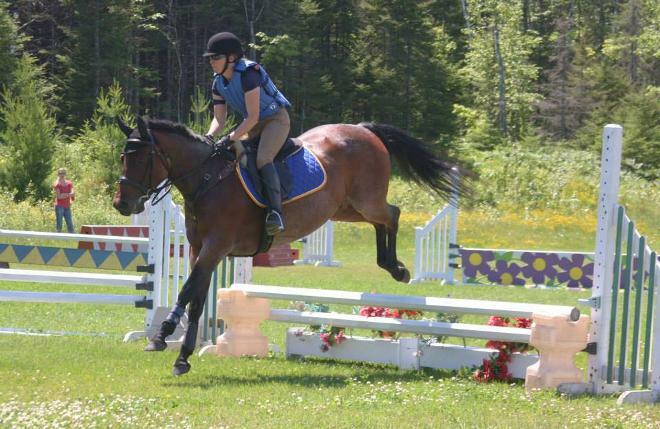 I have been involved with Chequamegon Pony Club for 13 years, since moving to the Ashland area and have served as District Commissioner, Joint D.C., Secretary and am currently an Instructor. I believe in Pony Club and what it has to offer and will continue to be involved and help our young riders learn proper, safe horsemanship, teamwork and compassion for these wonderful animals.